Miroslav Michael Djordjevich was born in Belgrade, Dorcol, where he graduated from high school “Prva muška gimnazija”, and emigrated to the U.S. in 1956. Working as a manual laborer, he saved enough money for his education and enrolled the University of California, Berkeley, where he graduated in Banking and Finance in 1960, and met his future wife Marie from San Francisco. When he finished his post-graduate studies in 1993, they got married. They have three children. During the 80’s, with the partnership of the several major financial companies in America, he founded two financial firms: USF&G Financial Security and its successor - Capital Guaranty Company, which entered at the New York Stock Exchange in 1993. During the first decade, under his leadership, Capital Guaranty was involved in financing $18 billion in various infrastructure projects in America. Later on, he founded an international bank in the United States and expanded operations successfully in former Yugoslavia. 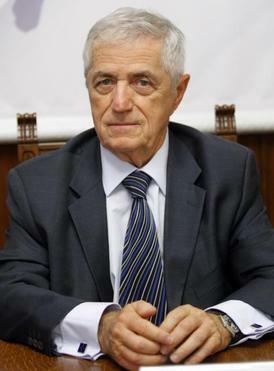 In late 1999, to help unite the democratic opposition to implement the transition to democracy in Serbia, he initiated and organized the Sentandrea Congress in Hungary, which was the first official meeting between all-Serbian diaspora and democratic leaders in Serbia since 1944. Together with two distinguished Serbian families, Vidak Chelovich’s from Detroit and Bora Vukovich’s from Denver, in 1993, he founded the Studenica Foundation, and has been its chairman since. In 1969, Djordjevich received the Americanism Medal from the National Society of the Daughters of the American Revolution, and in 1967 the Excellence Award of the American Security Council. Since 1983, he has been included in Who’s Who in America. Along with his extremely active business and public life, Djordjevich was the author of many professional and other publications. Among them is his book of essays, “About Happy Living” and book of poetry.